Qt 5.9.0 LTS and Qt 5.9.1 LTS on macOS Sierra 10.12.5. Using Qt 5.6.x LTS, a QTabBar object properly renders the icon associated with a given tab. 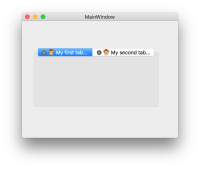 However, using Qt 5.9.x LTS, the icon is not rendered in the right place anymore and may, in fact, even overlap with the tab title itself (if that one is too long). Attached is a small project that illustrates the issue, as well as a couple of screenshots when building the project with Qt 5.6.2 LTS and Qt 5.9.1 LTS, respectively. Note that the close button also disappears using Qt 5.9.x LTS, but this is already being addressed in QTBUG-61092.